I am hooked on your blog!! Thank you for sharing your life with us. This one specially touched my heart. Your Dad saved himself and your entire family. And yes, I do believe God listened as He knew your Dad begged from the deep recesses of his soul. Every moment is so precious. 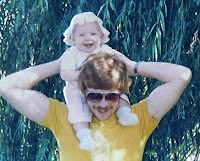 I miss my Dad everyday and would you know it, I am more closer to him now that he is gone than when he was alive.